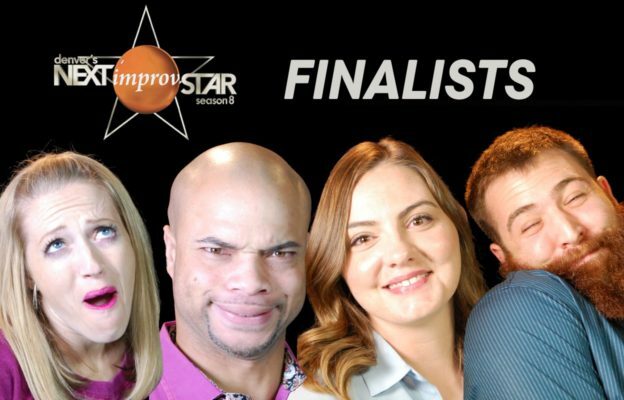 Labeling Denver’s Next Improv Star as a competition is a bit disingenuous. A live, improvised show at the Bovine Metropolis theater in Denver, CO challenges its contestants cast by working together in groups for 14 weeks in a series of surprise challenges, culminating in the finale with 2017’s four finalists: Brittany Lee, Dre Ford, Elizabeth Komos, and Luke Biedscheid. This is the eighth season of DNIS, and through each week’s challenges, each player must help and elevate their competition to succeed themselves. This entry was posted in Miscellaneous and tagged Bovine Metropolis, DNIS, improv on May 19, 2017 by Mario Lurig.